Upholstery Kit: The X3 Comes with a complete Upholstery Kit featuring the Universal Hand Tool. 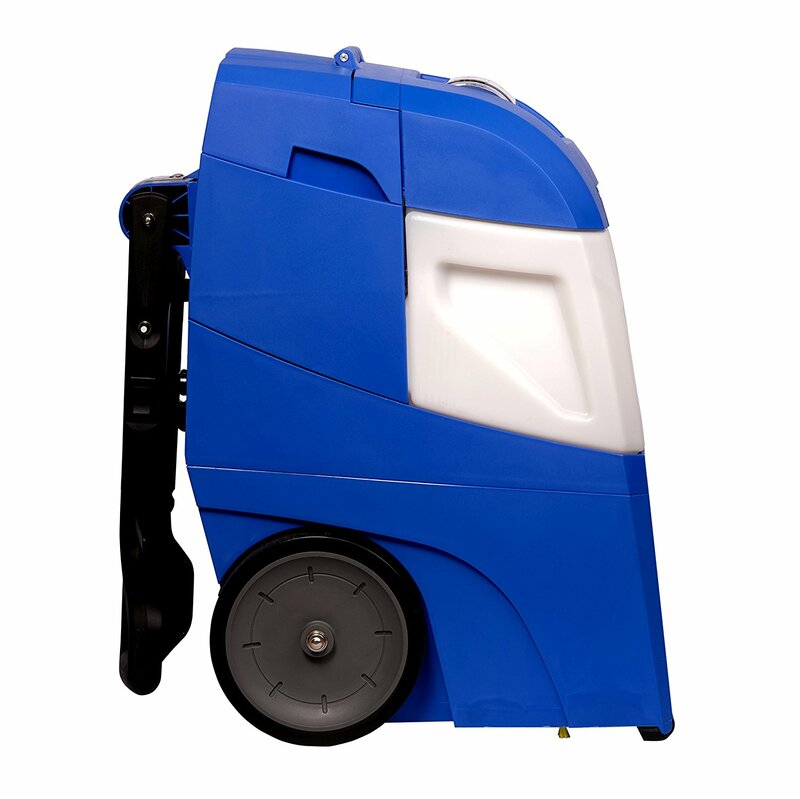 Powerful suction equal to the machine’s normal intake makes cleaning quick and easy. The 12′ hose attachment also lets you clean stairs, cars, boats and RV’s. The handheld Soft Surface Versatility Tool deep cleans all the soft surfaces in your home including chairs, stairs, couches, mattresses, pet beds, car mats, car seats and more. Rug Doctor® carpet cleaning machines have been manufactured, tested, and inspected in accordance with Rug Doctor’s high standards of quality. 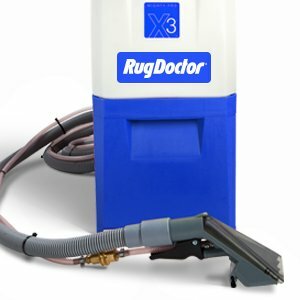 The Rug Doctor Mighty Pro X3 (“Machine”) is backed by a five (5) year limited warranty (“Warranty”). Please consult your User’s Guide to see the full terms of your Warranty. Rug Doctor gives you, the original purchaser, who retains proof of purchase from Rug Doctor or an authorized Rug Doctor Dealer, this Warranty for your Machine acquired for normal household use (commercial and rental use is excluded). You are responsible for notifying Rug Doctor within thirty (30) days of original purchase if any parts or components are missing on your Machine. Rug Doctor will, for the original purchaser, repair or replace including labor, any part that is defective in material or workmanship for your Machine within the Warranty period listed above. This Warranty applies for normal household use only. The following exclusions apply for Machine and part(s) failures due to: 1) normal wear and tear; 2) Machine alterations and 3) abuse or misuse of the Machine, including use not in accordance with the “User’s Guide”. This Warranty does not provide for a refund of the purchase price. For best operating efficiency and cleaning use of Rug Doctor products is recommended. Use of the Machine for rental voids the Warranty and is not permitted under Federal Law (see “UNAUTHORIZED USE” statement below). Commercial use is excluded under this Warranty however the “ONE YEAR LIMITED COMMERCIAL WARRANTY” applies, as shown below. Rug Doctor is not liable for any consequential or incidental damages of any nature involving the purchase/use of your Machine. In no event shall Rug Doctor’s liability exceed the purchase price of the Machine. Some states do not allow the exclusion or limitation of incidental or consequential damages, so the above limitations or exclusion may not apply to you. ALL OTHER WARRANTIES WHETHER ORAL OR WRITTEN ARE EXPRESSLY DISCLAIMED. THE IMPLIED WARRANTIES OF MERCHANTABILITY, AND FITNESS FOR A PARTICULAR PURPOSE, WHICH MAY ARISE BY OPERATION OF LAW, ARE LIMITED TO FIVE (5) YEARS FROM THE PROVEN DATE OF PURCHASE UNLESS APPLICABLE STATE LAW PROVIDES OTHERWISE. If a Machine is returned to a Warranty center for repair within thirty (30) days of original purchase, Rug Doctor pays the freight charges both to the Warranty center and back to you. Thereafter, you may be directed to take the Machine to a local repair center or required to ship the Machine to a Rug Doctor Warranty center should additional repairs be required during the Warranty period. During the Warranty period, but after the initial thirty (30) days, you will be responsible to pay any freight charges for shipment to the Warranty center for repairs. Rug Doctor will pay the freight charges to return your Machine to you. To obtain Warranty assistance, please call 1-800-RUG DOCTOR (1-800-784-3628), or email consumer.support@rugdoctor.com. Rug Doctor will need the following information in order to assist you: your name, address and telephone number, product model and serial number, proof of purchase showing date and place of purchase. Please explain the nature of the problem. Rug Doctor will review all the facts involved and advise you as to recommended procedure. We recommend you keep the original carton and packing materials. Use of this Machine with Rug Doctor Trademarks for rental purposes is UNAUTHORIZED and is in violation of U.S.C. Section 1114(I) and 15 U.S.C. Section 1125(a). All of the Warranty terms as expressed above shall apply in all respects, for the original United States purchaser of a Rug Doctor carpet cleaning Machine, who purchases/uses the Machine commercially (not in household use), except the Warranty period for the defects in material or workmanship as well as housing parts for commercial use Machine shall be one (1) year. You can register your Rug Doctor Machine at www.rugdoctor.com.